Add flour, salt, and confectioner’s sugar to a large bowl and stir to combine. Add butter in cubes and start to knead with your hands. Add egg yolks and water and knead until a smooth dough forms. Wrap dough in plastic wrap and refrigerate for approx. 1 hr. Roll out the dough on a floured work surface until approx. 3-mm/0.2-in thick. Trim the sides as needed and cut the dough into an even amount of rectangles of 5x8-cm/2x3-in. Transfer half of them onto a parchment-lined baking sheet. Add milk and egg to a bowl, stir to combine and set aside. Add cane sugar and cinnamon to a second bowl and stir to combine. Set aside. Add water, strawberry jam, and starch to a small pot over medium heat and whisk to combine. Heat for approx. 2 min., then remove from heat and let cool down a bit. Brush dough rectangles on the baking sheet with egg wash. Add apple sauce to one third of them, leaving some space around the edges. Sprinkle some cinnamon-sugar on top. Spoon jam filling onto another third of the dough rectangles and add Nutella onto remaining ones, always leaving some space around the edges. Use a fork to poke holes in the remaining half of the dough, then transfer them onto the filled dough rectangles on the baking sheet. Use your fingertips to press around the filling, then use a fork to seal the edges so the filling will stay inside. Preheat oven to 175°C/350°F and refrigerate pop tarts for approx. 20 min. Afterwards, bake them for approx. 20 min. until golden brown. Let cool. While the pop tarts are baking, prepare toppings for each kind. Add milk, vanilla extract, and confectioner’s sugar to a small bowl and stir to combine. Set aisde. Once the pop tarts are baked and cooled down, add toppings. Top applesauce filled pop tarts with sugar icing and remaining cinnamon sugar mixture. 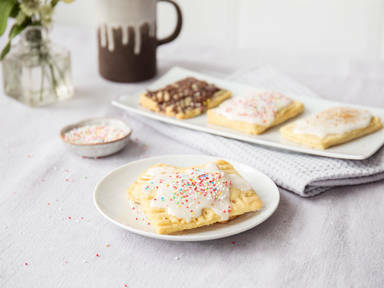 For jam filled pop tarts, add some sugar icing and colorful sprinkles on top. Drizzle melted dark chocolate onto Nutella filled pop tarts and add some chocolate sprinkles on top. Let dry before serving and enjoy!